Casing connections (ОКК1, ОКК2, ОКК3) are designed for connections of protective and casing strings, capsulation and pressure control in space between them. Protective string is supported with slip-type tubing catchers. 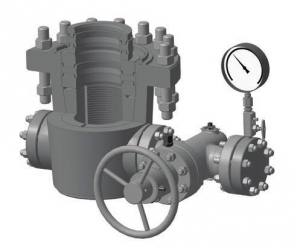 Connections is equipped with wall packers that enables pressurizing flange coupling of body frames of casing head and casing connections.